Vikings have captured our imaginations in a way that no other people in history have done. Maybe we have ancestral memories of their falling upon us without warning, taking what they wanted and burning the rest. If you had lived during their heyday, Vikings could never have been far from your thoughts. They would always have been there, creeping along the edges of your imagination and your fears, and it would have been equally so for your grandparents before you and your grandchildren after you. There may have been Huns and Goths, Mongols and Turks, Persians and Saracens, stalking along the borderlands of European civilization, but none can compare now in our imaginations to the Vikings. In thinking about the Viking-fantasy story, it occurs to me now that there are three types. First is the type in which Vikings are the encountered. We see them from the outside, from the perspective of perhaps a more civilized observer. I haven't yet read "A Yank at Valhalla" by Edmond Hamilton (Startling Stories, Jan. 1941), but I suspect that this is an example of the first type. Next is the type in which Vikings are the encounterers. (Blogger doesn't like that word.) In this type, we see things from the perspective of the Vikings themselves, very often in their encounters--historically accurate or not--with American Indians. I have a book, Prince Valiant in the New World by Harold Foster (Nostalgia Press, 1976), that tells such a tale. (Beowulf, in which Grendel and his mother are the encountered, is also of this type, I think.) The third type is the story of the Vikings as a people, their ways of life among themselves and in their own world and culture. If fantasy and science fiction are ultimately stories of encounter, then it's hard, it seems to me, for this third type to fall within those genres, unless the monsters, gods, witches, and undead encountered are a part of Norse mythology and folklore itself and not something from the outside. My friend Hlafbrot has pointed out that Eric Brighteyes by H. Rider Haggard (1891) has a place on the list of Viking literature. I have never read this book, but it's listed in the Internet Speculative Fiction Database, indicating that it's a genre work and not one of conventional or mainstream literature. In fact, if Eric Brighteyes was the first or one of the first modern Viking stories, then maybe it was also the beginning of the Viking-fantasy in our popular culture. Pulp magazines arrived on the scene just five years after Eric Brighteyes was published. I can't say when the first Viking story appeared in a pulp magazine. I also can't say what the first Viking story in Weird Tales might have been. Writers and readers of "The Unique Magazine" seem to have been far more interested in tales of the Orient and the tropics. (1) Robert E. Howard is supposed to have written a lot of Viking stories or quasi-Viking stories. The one that comes to mind, "The Frost Giant's Daughter," never made it into Weird Tales. After writing about Vikings the other day, I cast about for a book to read and came quickly enough to a novel by one of my favorite authors for children. 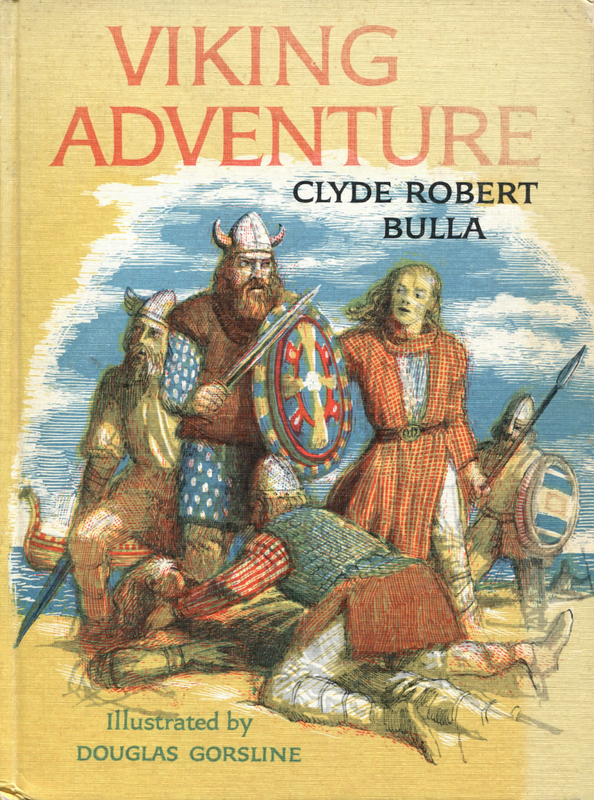 It's called Viking Adventure, and it's by Clyde Robert Bulla (1914-2007). Like so many Viking stories, this one is about an encounter with American Indians before Columbus. And like so many of the late Mr. Bulla's books, it is told in what I hear as a melancholy voice. Although his books are for children, Clyde Robert Bulla knew what it is to be a child, to suffer pain and loss, loneliness and yearning, to feel small and out of place, to feel like running and hiding, to dream and to have one's dreams thwarted or unfulfilled. If a good book is one that resounds within you even after you have finished reading it, then Viking Adventure is a good book, better, I would hazard, than myriads of supposedly serious and ambitious novels written for adults. (1) If Viking stories are Northerns, stories of the tropics are Southerns, and those of the Orient are Easterns, then there was far more emphasis on Southerns and Easterns in the pulps than there was on Northerns. Or if people wrote and read stories of the Far North, they were about the North Woods, about the taiga and the tundra, Alaska, the Yukon, and the Arctic, all set in the present of the pulp-fiction era or in the recent past. There was even a pulp magazine called North-West Stories. 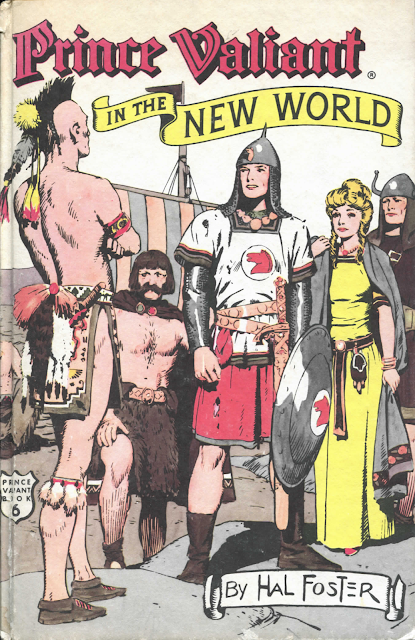 Prince Valiant in the New World (1976) is Prince Valiant Book 6, part of a series of storybooks adapted from the comic strip by Hal Foster and published by Nostalgia Press of New York City. Here is the encounter depicted again and again in popular culture: the Viking meets the American Indian in a time before Columbus. 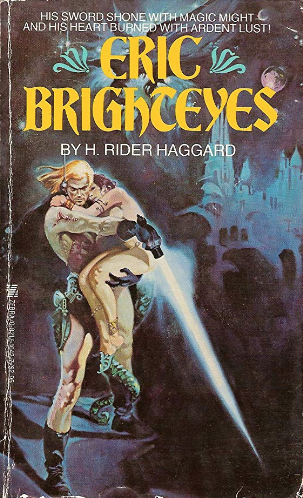 Eric Brighteyes by H. Rider Haggard, originally published in 1891, was reprinted again and again during the twentieth century. Here is the cover of the Zebra paperback edition of 1978. The identity of the cover artist is unknown. The furious action (and the depiction of the hero's anatomy) may be under the influence of Frank Frazetta, but the technique is purely 1970s, like that of Michael William Kaluta, Berni Wrightson, or Jeffrey Jones. Update: I hear from bthom1 that the cover artist is Esteban Maroto. Thanks bthom1. Zebra reprinted Eric Brighteyes in 1982 with different cover art, but the artist is again unknown. 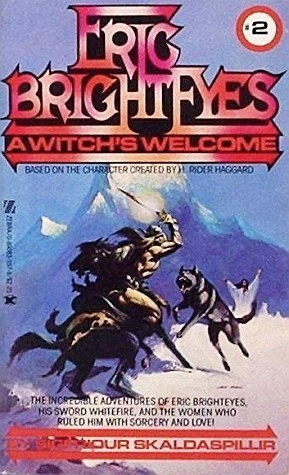 In 1979, Zebra Books issued a sequel, Eric Brighteyes: A Witch's Welcome, penned by Sigfriour Skaldaspillir, better known as Mildred Downey Broxon. 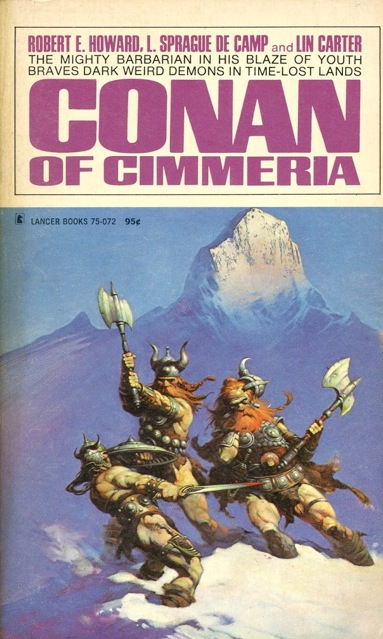 The cover artist was Ken Barr, but the mountain in the background wasn't his . . .
For he swiped it from Frank Frazetta's cover for Conan of Cimmeria, in which the quasi-Viking story "The Frost Giant's Daughter" appeared. Though offered to Weird Tales, "The Frost Giant's Daughter" was refused by its editor, Farnsworth Wright, and went instead to the March 1934 issue of The Fantasy Fan. Frazetta's illustration of the story is justly famous. In 1963, Thomas Y. Crowell Company of New York published Viking Adventure by Clyde Robert Bulla. Here's the cover of the Weekly Reader Children's Book Club version, with illustrations by Douglas Gorsline. Viking Adventure is the story of a boy named Sigurd who goes on an adventure far from home, to Wineland, our America, inhabited only by what we now call Indians. It is a moving story of growth and loss, and I recommend it. There were Westerns in the pulps, but there were also Northerns, if you want to call them that, but Northerns are not about Vikings. Instead, they're about what Bob and Doug McKenzie call the Great White North. In the pulp magazine North-West Stories (later North-West Romances), these two genres lived side by side. Here is an example of the cover, from the Winter issue of 1950, showing a sort-of Betty Hutton lookalike with her parka conveniently undone and her sweater conveniently tight. This was the 1950s after all, the era of the sweater girl. Anyway, if this were a Weird Tales cover, it would fall into the category of "Woman and Wolf" (click here). 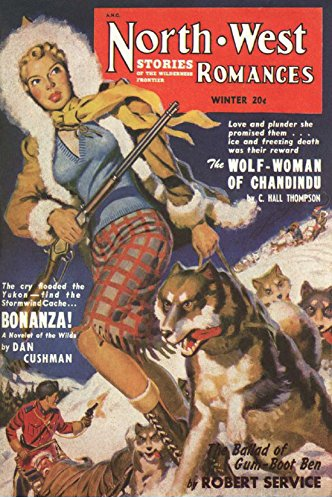 The title story in fact is called "The Wolf-Woman of Chandindu," by C. Hall Thompson, who also, as chance would have it, contributed to Weird Tales. More evidence that all things form circles. Eric Brighteyes contains various supernatural elements. One of the characters is a witch and their is a great surreal supernatural scene just before the climax. It's not my favorite Haggard (that would be People of the Mist), but it is pretty darn good. Thanks, FLF, for the confirmation that Eric Brighteyes has supernatural elements. It's what we need if we're going to include this book in the category of Viking-fantasy. 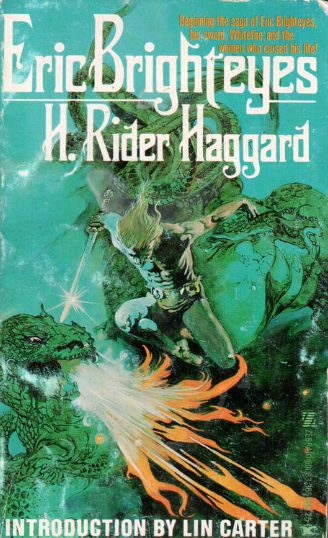 Haggard also wrote another Viking novel The Wanderer's Necklace which I haven't read so I can't say if it has supernatural elements. The Wanderer's Necklace is still in my To-Be-Read pile, too, but that fact that it was reprinted in Famous Fantastic Mysteries makes the supernatural element a pretty good bet.